I was in college and had a student deferment. I was playing trombone in several groups: a jazz group; a big band; and a symphony orchestra. I was so busy that I left college to devote my time to becoming a better musician with the goal of being a studio musician. I also got involved with sports car racing and became a member of the Sports Car Club of America (SCCA). For about a year and a half I campaigned in the local races and eventually earned a national license. During my off time I played pool, plenty of pool, and got the nickname “Fast Freddy” from the movie “The Hustler” starring Paul Newman and Jackie Gleason. Paul Newman had the nickname “Fast Eddie” Felson in the movie. After I left college my draft board reclassified me 1A. (Whoops, I was not paying attention to the draft.) So, eventually I was called for a physical. One of my band mates just finished his Army service playing in the band at Fort MacArthur in San Pedro, CA. He set me up with an audition which I passed and then was given a letter requesting me to be assigned to the Army Band at Fort MacArthur. No worries, yet. I was notified to take a physical and reported to AFEES Los Angeles November 2, 1966. During the physical we were in a large circle in a room wearing just our underwear. A doctor’s assistant and a clerk carrying a clipboard came up to us and said “Cough”. Then he went to the outside of the circle and when we were approached told us to drop our drawers and grab our ankles. He inspected my backside and then said to the clerk “4F.” I was handed the paperwork and then told to go into the next room to see the Doctor. Within a month I received a letter to report for induction at the AFEES center in downtown Los Angeles on February 2, 1967. During the morning we took written tests. I was told that anyone scoring above a 35 was eligible for service. And that if you signed your name would get a 35. I scored 100% on the AFQT 8C and afterwards was told that I could be a candidate for Officer Candidate School (OCS). I never considered myself smart. I was an average student getting C’s and some B’s. I replied, no thanks. I handed my letter to one of the officers and was told it would be placed in my file. No, worries, yet. After the testing was completed we were handed a voucher for lunch at a local restaurant. All I remember was that it was the worst food I ever had. But, I had yet to taste Army food. After lunch we reported back to the induction center and lined up and were sworn into the Army. Then we were given more paperwork and loaded onto buses heading north to Fort Ord near Monterey, California. We arrived about midnight and a Drill Instructor (DI) come on the bus and just did the Army thing about how worthless we were and kept shouting at us and when he told us to get off the bus we were to line up. Off the bus and into the worst lines you ever saw and he kept up the shouting and had some PFCs to help us. We were then marched (I should say walked to the reception barracks). That night I don’t think anyone slept and we just talked to each other. Early the next morning we were rousted out of bed then lined up and off we went to receive uniforms and haircuts. We packed our civilian clothes into our duffle bags. What a motley crew we were. 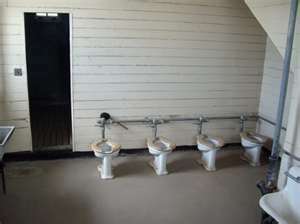 Now these barracks were very old and the latrine had no privacy stalls. Just toilets side-by-side. Being a rather private person at the time I was too nervous to use the toilet. During the third night I really had to go and gave in to that urge the next morning. I sat on the toilet to do my business and when the aroma reached everyone in the latrine it cleared out and I was left alone. When I finished and went outside they were laughing at me and that something must have crawled into me and died. The first week was test week. I scored very well on all the tests and was invited to take additional tests. One of the additional tests I took was the qualifying test for Warrant Officer Flight School. If you scored above a certain score you could skip basic and go directly to Fort Wolters for helicopter school. If you scored within a range below that you could go to Fort Wolters after completing Basic Training. After the results came back I was visited by two Warrant Officers and told that I had the highest score they had ever seen and that I could avoid basic training and go directly to Fort Wolters for flight training as a helicopter pilot. That amazed me since I had no knowledge of airplanes and/or helicopters and at least half of the test was a horizon and you were asked which direction was the rudder, ailerons, the stick. I had flown model aircraft as a 6th grader so I guess that helped me. I replied, no thanks. After all I was going to play in the Army band. I made inquiries about the letter in my file about the Army band. Do you really think it was in my file? Of course not. So, I arranged another audition with the band at Fort Ord. I reported to the first sergeant and once again passed and was told that after basic training I would be assigned to the Army band. 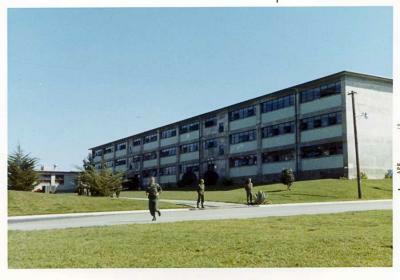 After our initial week of testing we moved up the hill to the newer barracks that were built of concrete blocks. Lots of marching, drilling, running and the training one would expect. One thing to note was that it was February and March and it was extremely cold with the wind coming off the ocean. We were only issued two Army blankets and that was not enough. 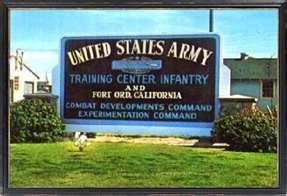 Previously, there had been several deaths from meningitis at Fort Ord and one way to combat that was to leave all the windows open in the barracks to provide for ventilation. At least that is what we were told. One good thing about it was that we were required to get 6-8 hours of sleep each night. 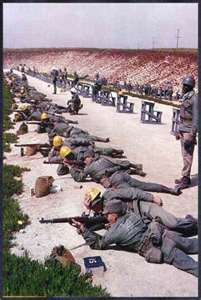 The rifle range was on the beach. 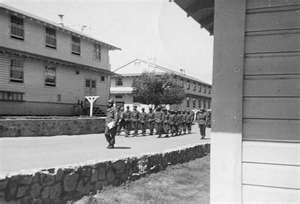 For those days, we ran in formation down through the parade ground past the reception barracks and under Highway 101 to the rifle range. It did not matter if it was raining or not. Then after rifle range practice we ran in formation back up the hill. It was exceedingly difficult for me to run all that distance up hill, but I managed to do it almost every time. Our DI was a pretty good guy. He was an E6 and fairly easy going. He did not yell, scream or shout but he was a disciplinarian and trained us well. One of the other DI’s was an E7 and one real tough “mutha.” No one liked him because he was such an unreasonable jerk constantly getting in your face and yelling, screaming and shouting. He was a veteran of Korea and wore a Combat Infantry Badge (CIB) I recall that his name was SFC Conover. 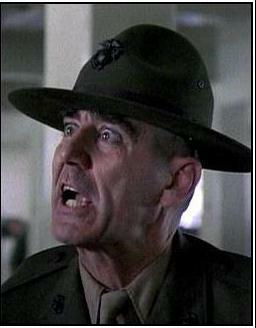 Do you remember the film “Full Metal Jacket?” He was like the DI Gunnery Sergeant Hartman portrayed by R. Lee Ermey. Approximately one day before graduating from basic training we got our orders. My orders said advanced infantry training at Fort Polk, LA. Now, I am worried. I went down to the Band room and talked to the first sergeant and was told there was nothing he could do. Now, I really was worried. After graduation in April 1967 we boarded busses and were taken to the local airport in Monterey. We got on board a rickety old plane and flew somewhere in Texas then took busses into Fort Polk, LA. Welcome to “Tigerland” and advanced individual training. thanks now i have facts on my report. there was a plt e7 name clayborn mordor plt tiger land 1966 i dont know the co we were in but we had a swimming pool at end of bar.5 if eny can tell me what co that was it sure help. The voucher you received was for Corky’s and was beyond any doubt the worst meal I had ever eaten. I was at AFEES in March 1966 and would serve with the 14th Cavalry on the East German border near Bad Hershfeld until 1968.